As the name suggest, TITAN or giant that has 6inch display and TV capable, lets just put an equation like this Android + TV= DroidTV, which defines Cherry Mobile Titan TV. 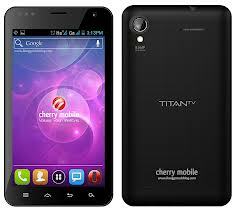 I won't give as much review of Cherry Mobile Titan TV as many bloggers already done it. Another great feature of Cherry Mobile Titan TV is the Gesture Mode Function which works like Air Shuffle of O+ Smartphones, we can also consider calling Cherry Mobile Titan TV as portable cinema, as far as the huge display is concern. Another note of Cherry Mobile Titan TV is the Dual Core processor of 1Ghz, although not much power for HD games, but HD movies works well, plus 1GB RAM for more multitasking. If have this phone, please do share your experience with us. Thanks!